Shares of Louisiana Pacific (LPX) have recently corrected from their all-time high, which presents an unparalleled opportunity for share accumulation as the company’s fundamentals have a solid base, and the management pursues a shareholder value-focused approach to capital allocation. Louisiana Pacific Corporation is a leading manufacturer of building products; most of which are made from wood and lumber. The company currently has approximately 5,000 employees, with about a fifth being part of labor unions. The company’s sales are classified into 6 segments – Siding, OSB, Engineered wood products, South America, Other and Intersegment sales, with Siding and OSB accounting for the majority of revenues (~79 percent). In terms of Adj. EBITDA margins, OSB and Siding also belonged to the most profitable segments – with 21 and 32 adjusted EBITDA margins, respectively. Geographically, most of the company’s revenues are originated in the United States (~72 percent) and Canada (~22 percent). Reading through the company’s latest earnings call transcript, one can quickly find that the company is currently undergoing a business transition from a pure commodity OSB producer to a more diversified cash-generative business. On this front, the key part of the company’s strategy is to expand its siding business, with a long-term annual revenue growth target of 12 to 14 percent. Brad Southern, Chief Executive Officer of the company, also sees a favorable demographic trend wave arising from the entry of millennial workforce into the housing market. Lastly, the management identified several areas that present a significant opportunity for a geographic expansion outside the Midwest, including the Eastern shore and the southern and southwest part of the United States, and seems to ready to take action to seize this opportunity. Over the last ten years, the management has gradually lifted the company’s profitability metrics from the negative to the positive territory to exceptional figures. The company’s trailing twelve months ROA, ROI, and ROE currently total 16, 18, and 24 percent, respectively. Besides rising profitability, the company’s financial statements display a remarkable inflection point in net operating cash flow growth. With respect to its balance sheet sum and market capitalization of little over $3.2 billion U.S. dollars, Louisiana Pacific has also a strong cash position, consisting of $678 million excess cash and $350 million of potential incremental debt capacity. Louisiana Pacific is a company with a shareholder-friendly policy. 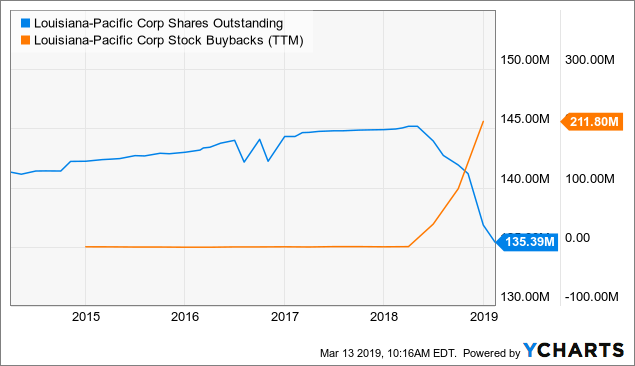 Last month, the company launched its accelerated $400 million share repurchase program, which is part of a $600 million share repurchase plan authorized alongside with fourth-quarter earnings announcement. As can be observed in the output below, the company started buying back shares just recently – early in 2018. Should the company fully use the program, the number of shares outstanding can decrease by roughly 24 million to 111 million. On the other hand, one thing at which the company seems to be momentarily struggling is digital marketing. Based on SimilarWeb statistics, the company’s website traffic has been deteriorating. According to a different website analytics tool – Google PageSpeed Insights – Louisiana Pacific’s website speed is average to slow compared to other pages in Google’s sample. Plugging in Louisiana Pacific’s financial statements’ figures into my DCF template, the company’s shares seem to be severely undervalued. Under perpetuity growth method, with a terminal growth rate of 2 percent, constant 10 percent annual revenue growth over the next five years and 19 percent EBIT margin, fair value of the stock comes at 63 USD. 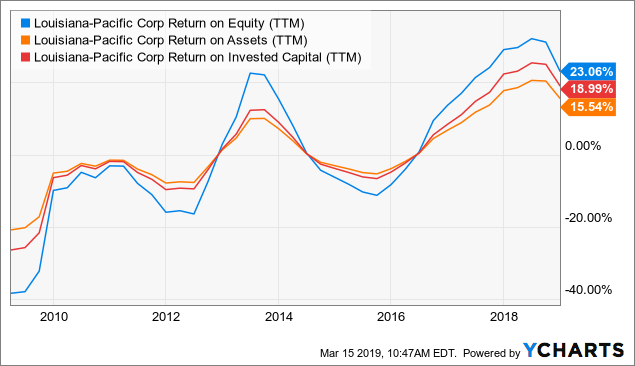 Under the EBITDA multiple approach of a discounted cash flow model, the intrinsic value per share of the company stands roughly at 40 USD if we assume that the appropriate exit EV/EBITDA multiple in five years’ time is around 5x. From a different perspective working with operating earnings multiples, Louisiana Pacific’s shares are also tremendously undervalued. Using the Fast Graphs forecasting calculator, with a 25 percent adjusted operating earnings growth rate assumption, the company’s intrinsic value by the end of November FY2024 is forecasted to reach up to US$43. This implies a total annualized rate of return upside potential up to 16 percent. 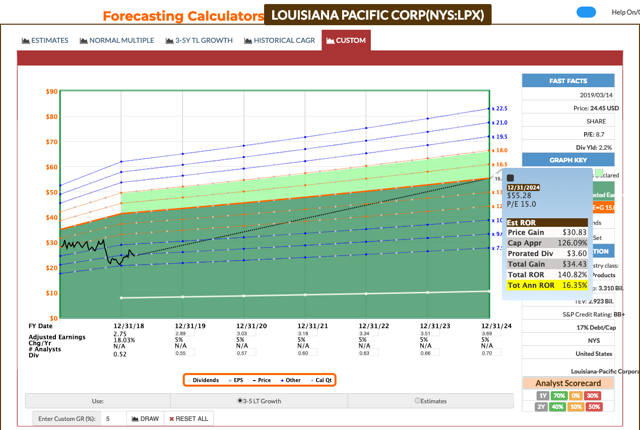 In the light of revenue variation of Peter Lynch’s popular earnings line for the projection of probable per share values of the company, Louisiana Pacific’s shares long run potential seems to be skewed to the positive territory. 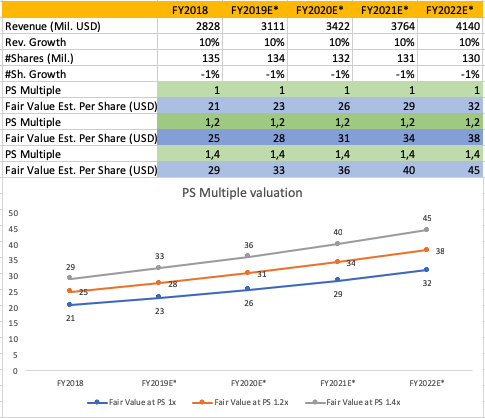 According to my model, assuming 10 percent annual revenue growth, zero percent annual equity dilution factor, a price-to-sales PS ratio of around 1.2x, the company’s share price by the end of 2022 could hover around US$38. This scenario suggests an annualized rate of return potential as much as 11 percent in the following years. To sum up, Louisiana Pacific is a very niche business in the home construction market. The company has a sound expansion intention which could be accelerated if new home construction is stimulated by a catalyst such as a reversal in tightening interest rate policy or revived digital presentation. Lastly, ongoing shareholder policy indicates that the company has not only a strong financial position but also a great willingness to share its resources with its shareholders. Additional disclosure: Disclaimer: Please note that this article has an informative purpose, expresses its author’s opinion, and does not constitute investment recommendation or advice. The author does not know individual investor’s circumstances, portfolio constraints, etc. Readers are expected to do their own analysis prior to making any investment decisions.